No, I’m not talking about those flat gray or brown skin spots we get as we age, also called sunspots. I’m referring to dark spots that pop up on the sun. The sun may look pretty peaceful from 93 million miles away, but if you were to get a little closer to it, not only would you likely end up charbroiled, you’d also see that the sun is actually a very active place indeed. From streams of particles in solar wind to massive solar flares, the sun is literally the hotbed of a lot of violent activity. When the sun’s surface plasma interacts with its magnetic field, strange things can begin happening on the surface of the sun. When the magnetic field strengthens, it lowers the pressure of the gas in some areas of the surface, causing the temperature of the gas to drop. This, in turn, creates (relatively) small, dark areas that vary in size and location and usually form in clusters or bands either above or below the equator. These areas, called sun spots, are cooler than the surrounding surface of the sun. Well, let me put that into context, just for a moment. The sun’s surface is roughly 10,000 degrees Fahrenheit. The sunspots, on the other hand, are a mere 6,300 degrees Fahrenheit. Sun spots typically occur in cycles that last for roughly 11 years, and when they do occur, they usually make the news. And, while sun spots may look pretty small on the surface of the sun, each darkened spot is actually about as wide as planet Earth! It’s always important to remember this first rule about viewing sun spots: never look directly at the sun, as you will almost certainly suffer some level of blindness. 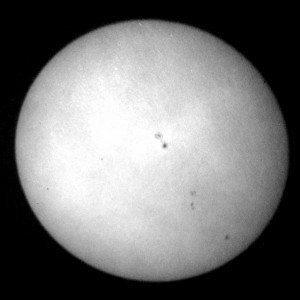 There is a really safe and easy way to view sun spots (as well as eclipses). Simply project the image of the sun through binoculars or a telescope on to a blank, white piece of paper. The image might look blurry at first, but by adjusting the distance between the binoculars or telescope and the paper, you can hone in on a sharper image. You could also try adjusting the lens on the telescope or binoculars to achieve the clearest focus. Sunspots have been an observational curiosity for millennia. In 28 B.C., the Chinese were already watching and recording sun spot activity. In 1607, Johannes Kepler thought he was viewing the transit of Mercury across the bright surface of the sun’s disc. But the sun spot cycle would be determined by an amateur astronomer named Heinrich Schwabe. Starting in 1826, Schwabe began making a series of solar observations that, by 1833, allowed him to determine that sun spots occur in cycles. Sun spots, which usually form in the latitudinal range of 5 to 35 degrees, usually begin the 11-year period in the higher latitudes then work their way to the lower latitudes as the cycle progresses onward. It’s interesting to note that from the year 1645 to 1715, scientist E. Maunder noticed that sun spot activities declined, which is an event called the Maunder Minimum. This period happens to coincide with the Little Ice Age, when many parts of the world endured much cooler than average weather; it was during that time we experienced the year without a summer.